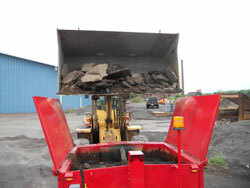 Asphalt recycling is a common practice within the asphalt industry. Typical asphalt recycling practices include 1) inclusion of removed/recycled asphalt chunks into a new batch of hot mix asphalt and 2) milling an asphalt surface and recycling it immediately for an overlay. A practice that is not as well known is on-site, overnight recycling of asphalt for pothole repairs and utility cut maintenance. 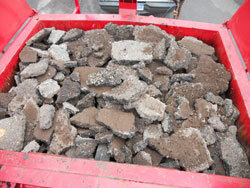 Asphalt recycling for road repairs is a cost effective solution to maintaining potholes and utility cuts year round. The properties of asphalt, aggregate and asphalt cement, work well together for recycling. All that is needed to recycle asphalt is heat and an asphalt rejeuvenator (when recycling older asphalt with a low oil-content). 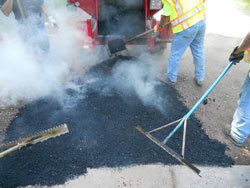 A rejuvenating agent adds asphalt maltenes back into the material. Once asphalt cement reaches 180 degrees F it returns to its original pliable state. To maintain the pliable nature of the asphalt cement, the aggregate needs to be brought up to temperature -- about 290-350 degree F, depending on the regional aggregate being recycled. Using 100% recycled asphalt for road repairs is a cost effective solution to asphalt maintenance. Asphalt recycling eliminates unnecessary waste involved in disposing of left over hot mix or torn up asphalt chunks and millings, saving its users thousands of dollars every year. Falcon Road Maintenance Equipment manufactures asphalt recycling hot patchers ½ ton-6 ton capacity in Midland, MI. Inc. Magazine recently recognized Falcon as the fastest growing road maintenance equipment manufacturer in the United States. Falcon currently has equipment in 36 states and with 17 state DOT’s. Visit www.falconrme.com for more information or contact Clayton at (616) 405-3807 or clayton@falconrme.com.